Nigeria Football Federation President, Amaju Pinnick has disclosed that distressed ex-international, Wilson Oruma has been offered the job of an assistant coach in one of the national teams setting. The former Delta State Sports administrator was unhappy with the sad situation of the former Golden Eaglets’ star that won the 1993 FIFA U-17 World Cup in Japan. Besides, Pinnick also sponsored Oruma’s hospital bills and relocated him to a better environment that would ensure his quick recovery. He stated that the NFF would do everything within their will-power to revive and stabilise Oruma’s career; while also revealing that they would seek for support for some of the clubs he played for in Europe. ‘’By next week, Oruma will move into my house before they finish furnishing the three bedrooms flat where he would stay’’, the NFF President confirmed to us. “His story is a pathetic one and we cannot allow him to die. I am rendering this help to him from one Warri man to another. We are Warri Ambassadors’’. ‘’All we need to do is to show him love. I ate with him. He’s stable. 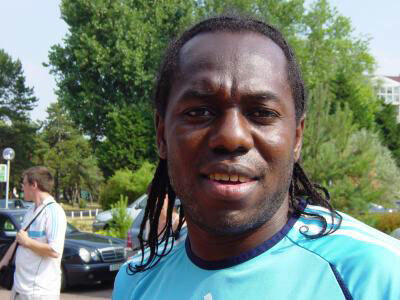 The NFF will include him to play a role in our award ceremony coming up soon. Thereafter, we’ll include him in the U-20 national team. Come June, we’ll also include him in the contingent to Russia to cheer the Super Eagles’’. “I’m still talking with some of the clubs he played for to allow him come and do a coaching course with them’’.